March 15 we will be hosting our second annual youth worship event for the teens of our area. This year’s theme is Generation Y focusing on the themes from James 2:17 which talks about putting your faith in actions. Many people call the younger Generations in our country Generation X. I am one of the earlier members of that Generation. Some have labeled the children of GenX Generation Y. But they are asking more than ever the question “Why?” Why do you believe in God? Why can’t I do whatever I want? Why do I have to abide by the rules of society? We want to help our youth know that they are loved by a God who sent his son to die for them. And if they will believe in Him, they can have a great life and hope of an afterlife. But that great life comes with a responsibility to live out their faith. So Generation Y will challenge them in this area. We’ve invited back Robby Kropiwnicki to speak to the youth. He did a great job and really had the kids listening to his exciting testimony. Also we have invited the popular band Caleb’s Faith. They are a band that really knows how to get the attention of youth as they sing the Gospel. We will also be serving pizza before and after the event. 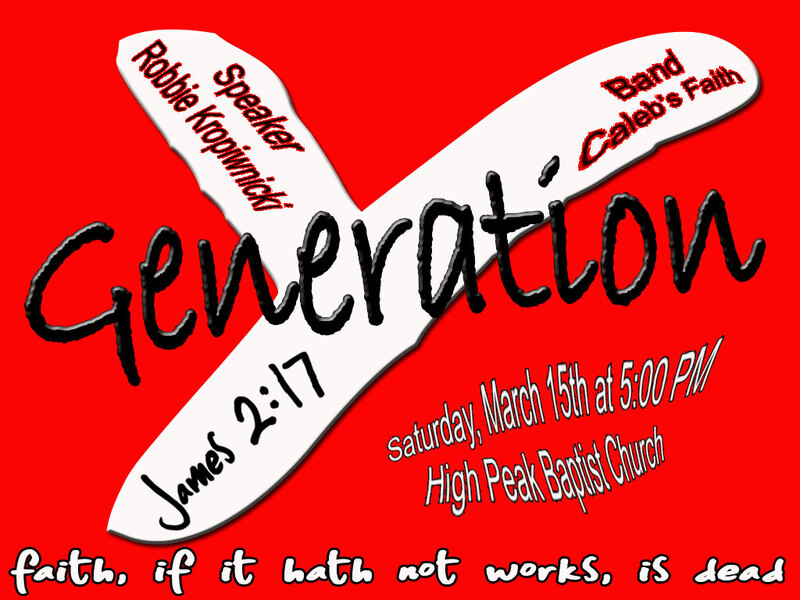 The time is 5:00 pm on March 15th at High Peak Baptist Church!